Zylofon Signee Charles Nii Armah Mensah popularly known as Shatta Wale won't rest his name in the showbiz Industry in the country and across board as he has stoked controversy with a statement he made at Reign Unveiled concert in London over the weekend. “I just wanna share that word with you. 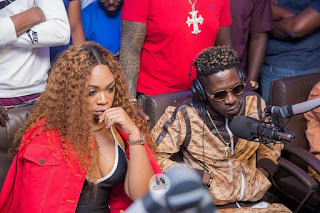 Shatta Wale is a very nice guy. All that you keep reading about me on google from Ghana…Ghana is a village, say village, village.” - he said. The concert held on Friday November 16, 2018, had over 2,000 music fans in attendance. The ‘Reign album’ world tour concert was produced and put together by Akwaaba UK. It comprises songs like ‘Wonders,’ ‘My Level,’ ‘Sister Sister,’ among others.